In the 1860's, Ball Hughes was an Artist-in-Residence at the Willey House, site of the 1826 Willey Tragedy, in Crawford Notch, northwest of the Village of North Conway, NH in the White Mountains. 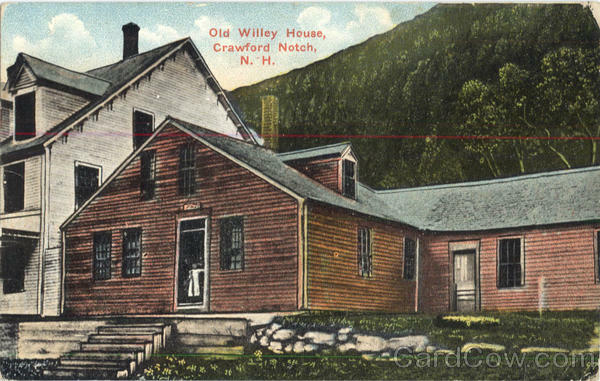 The Willey House was built in 1793 or 1798 (some say 1820) as a public house in Crawford Notch, about 23 miles northwest of the village of North Conway, NH, in the White Mountains. In 1825 it became the homestead of Samuel Willey, Jr. and his family. They operated it as an inn to accommodate travelers passing through the mountains on the notch road. In August 1826, a violent storm occurred and the Saco River began to rise in front of the house. The family apparently left the house to escape the flood, only to be buried in a huge landslide. Mr. and Mrs. Willey, their five children, and two hired men all perished but their house was left untouched. It was protected by a rock ledge on the hillside above it that split the major slide into two streams that flowed around the house. The news of the Willey family tragedy became a national legend as stories about it appeared in newspapers and magazines. The numerous (and varying accounts) of the tragedy attracted the attention of many artists and authors, primarily from Boston. A ballad was even written about it by Dr. T. W. Parsons, of Boston as well as several poems. Nathaniel Hawthorne wrote a fictionalized short story about the night before the slide based on the Willey Tragedy entitled The Ambitious Guest. It was first published in New-England Magazine in June of 1835 and later in the second volume of Twice-Told Tales in 1837. Read more at the Library of America’s Story of the Week: The Ambitious Quest, January 6, 2012. After the tragedy at the Willey House, the White Mountains became a popular subject for hundreds of artists in the nineteenth century. The landscape scenes painted by artists became known as White Mountain Art. See White Mountain Art on this site for information about Ball Hughes and White Mountain Art. The house was later occupied and in 1844 the house and its stable were repaired and a seventy by forty foot hotel was built adjacent to it. The old house was a favorite tavern in the region and visitors were charged a small fee to be escorted through rooms of the house. The remnant of the rock which protected the house during the tragedy was still behind the house and the track of the slide could be ascended through a scattered forest of birch trees, presumably where Ball Hughes studio was located. The postcard below shows the original 1-1/2 story Willey House with the newer inn attached to the left. There is a lengthy description of the Willey House and the Tragedy in Chronicles of the White Mountains by Frederick W. Kilbourne, The Riverside Press Cambridge. Boston: Houghton Mifflin Co., 1916, pp. 87-97. A sketch of the Willey House is between pp. 90 and 91. The expression "a case of the willies" evolved from the Willey Tragedy. See a different picture of the Willey House and Hotel with the mountain behind it for perspective on the power of the slide, by Canterbury Shaker Village available at Trekking New Hampshire, NH Tourism - A Quick History. The 4300 foot Mt. Willey rises over 2000 feet behind the site of the Willey House. Note that this site does not always work, if not try again later. The Willey House and inn was operated until it was destroyed by fire in 1898. A commemorative plague was placed at the site in 1926. The Willey House Historical Site is now part of the 5,775-acre Crawford Notch State Park. A 1999 grant application was submitted to the State of New Hampshire to build a replica of the original Willey House with a new visitors center but it's not known if it has been built yet. Use the Google Maps navigation controls to zoom in and out and recenter the view or drag the image to recenter. Select Sat or Ter to see satellite or terrain views. The the site is off U.S. Route 302 and is labeled Willey House. Some maps show it as the site of Willey House Camps, a campground of log cabins in the 1920's. The satellite view shows the exposed rock on the side of Mt. Willey near the site and the terrain view shows the elevation changes. The exposed rock "Slide" is popular with ice climbers in the winter. Route 302 follows the Saco River and the railroad tracks are to the west side of the road. See also Crawford Notch State Park Hiking Trails Map and Guide to Crawford State Park from the Online Guidebook by New Hampshire Vacation Home. See also JumpingFrog.com for postcards of the Willey House Camps and of Crawford Notch. Willey House is in the clearing in the center of the picture above, along U.S. Rt. 302. The 3900 ft. Mt. Webster is on the left and the bare rock slope of Willey's Slide is visible on 4300 ft. Mt. Willey on the right. The railroad tracks are on the west side of the notch, behind the Willey House. Watch the five minute drive through Crawford Notch below, a little faster than the stagecoach. Pass Willey House Historical Site about halfway through the video. Fall and winter runs are also available on YouTube. See New Hampshire Studio and White Mountain Art on this site for information about Ball Hughes studio and White Mountain Art. Do you know anything more about Ball Hughes studio behind the Willey House?